The Oscar Evo-Blade is a new and patented infinity edge profile. This is also sometimes known as a razor edge profile, plasterboard edge blade, plasterboard arrow trim or floating ceiling blade trim. These trims are designed to give bulky ceilings an elegant slim line effect and can also be used to create sharp recessed lighting channels. Gone are the days of having a thick vertical multi-layer ceiling edge. Until now, there has been an issue with this sort of infinity razor trim. Most drylining companies would only install them with a letter to say that they will crack along the back edge. It is also not possible to use them with acoustic plaster systems without causing long term discolouration and cracking. The Oscar Evo-Blade was developed by Oscar Acoustics following a meeting where an architect and contractor had specified a razor trim for use in a standard plaster and acoustic plaster ceiling. The drylining company said it would crack their plaster and Oscar Acoustics knew the cracking and air filtration issues it would cause to any acoustic plaster. The Evo-Blade is designed to prevent these problems by uniquely enabling the installer to position the plasterboard in different places to accommodate different depth finishes. As a result, it is perfect for both conventional plaster and Oscar Acoustics spray applied acoustic decorative finishes. Why would an acoustic product discolour with a conventional razor trim? All acoustic finishes are inherently air porous due to the fact they need to absorb sound. This means that when a room’s air pressure increases due to a door or window opening or closing, a gust of wind through an open aperture or a ventilation system starting up, air will be forced into an acoustic product which over time will filter out any dust in the air. This is not normally a problem, but when most of the acoustic ceiling is for example - 27mm thick and the part over the infinity razor trim is only 2mm thick, the air movement rates will be different, meaning one will change colour compared to the other over time. This can take years but in extreme case can take weeks. The Oscar Evo-Blade is designed with a shallow angle meaning that it appears as an infinity razor edge from far further back than other profiles. 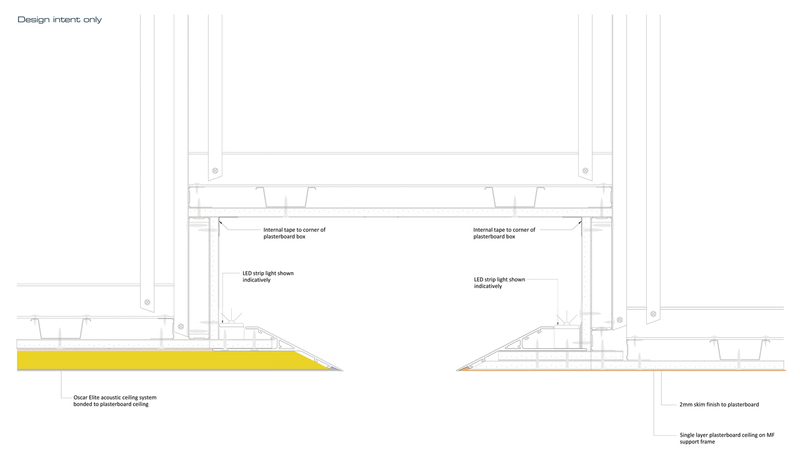 Along with being pre-powder coated, this can assist in minimising unwanted shadows and reflections when using as part of a feature light channel or feature lit ceiling edge. Razor edge trim, razor edge profile, plasterboard edge profile, plasterboard edge blade, plasterboard blade trim, plasterboard arrow trim, floating ceiling edge profile, floating ceiling edge blade, floating ceiling blade trim, floating ceiling arrow trim, infinity edge profile, infinity edge trim.